No and never since it is toxic to cats with even a small amount of it resulting in brain and liver damage. Hence, it is advisable to keep any alcoholic beverages like beer, wine or whiskey. 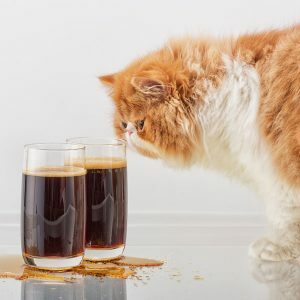 Foods prepared by adding alcohol like cakes or meat and fish cuisines as well as cough syrups, perfume and cleaning products are also equally dangerous and hazardous to cats. Alcohol is regarded as harmful to them with just two teaspoons of it causing a cat weighing five pounds to slip into a coma while an additional teaspoon of it could take its life. Though each variety of alcohol is equally bad, some have a higher risk than the other owing to their alcohol content. Beer has it in the lowest concentration of a mere 4% while wine contains approximately 10 % of it and certain hard liquor has about 90% of alcohol on an average. Alcohol poisoning treatment depends on how much of it a cat has ingested, determined through lab tests. The cats’ organs would also be checked, and those with a slow heartbeat would be put in ventilation. In most cases, the recovery span is between 8 and 12 hours but can be higher in severe cases. If your cat has ingested alcohol, contact a veterinarian at once or call the ASPCA Animal Poison Control Center Helpline at (1-888-426-4435).